Analog Devices and National Instruments have released an Analog Devices specific version of Multisim a SPICE Simulator. Multisim is based on Electronic Workbench, and can be downloaded for free. Design News has posted a web page listing microprocessor, sensor, control, lighting, MEMs, and test webinars as part of Digikey's 180 days of Education Program in it's continuing education center. The lectures are 45 minutes long, and are free but require registration to view. Past lectures are available for view as an archive. I just got an Arduino Uno microprocessor kit to help teach electronics to a couple of folks. I really liked the the YourDuinoRobo1 board because it has extra connectors pins to make it easier to connect sensors to it using three wire GVS cables so it effectively has a sensor shield built-in. The value for the Robo1 board, shield, cables, sensors (electronic bricks) was very very good, but I did not think it would arrive in time from China, so I ended up getting the Adafruit ARDX - v1.3 Experimentation Kit for Arduino (Uno R3) - v1.3 (see photo below) over the SparkFun kit because it was a little cheaper (actually I did not think that the SparkFun kit had motors or servos since they were not shown in the pictures but they are in the description). 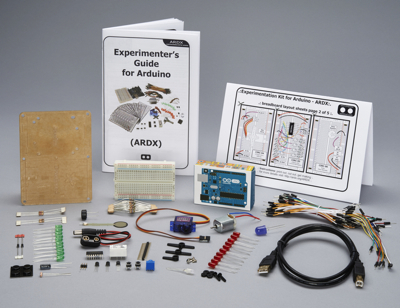 If this project goes well, I'm very tempted to get the Electronic Bricks Starter Set: Optional YourDuinos, Optional Box. I got a sensor shield too to make it a little easier for first timers to connect to sensors and motors. My goal is to get things going first and explain on how it worked so they can modify it and change as they see fit. The shield board is the SainSmart Sensor Shield V4 Module for arduino Duemilanove UNO Mega2560 ATMEL. This sensor shield board fits on the Arduino Uno and has extra connectors so you stack another shield board and use what ever pins are still available. I ran the Servo sketch example on pin 9 and the Tower Pro SG90 servo moves as expected with this board combination. I plan to incorporate these boards with Squishy Circuits and hot glue and stir stick building techniques from RobotGrrl. If there is time I'll try to include some simulation using CircuitLab and some 3D CAD with SketchUp. 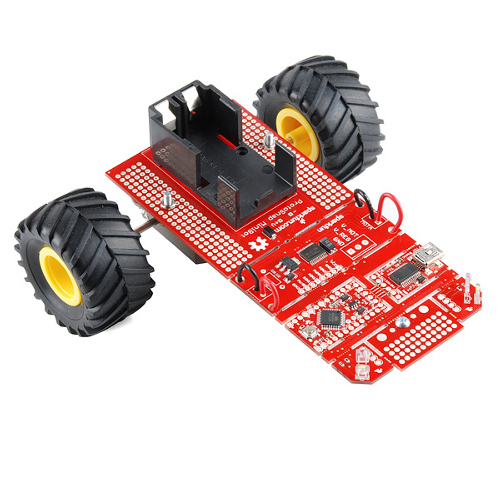 SparkFun just released the new Arduino based ProtoSnap - MiniBot Kit to teach the basics of building androids. Professor Leah Buechley from MIT give this interesting talk about making electronics and technology exciting for everyone in this video. She opts for soft substrates like fabrics and papers, and conductive inks and threads to build circuits. These materials make it easier for more people to build things than using traditional materials. 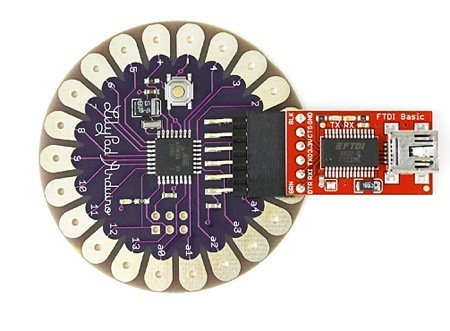 The LilyPad Arduino is specifically designed to be sewn into garments using conductive thread for example. Her website High-low Tech provides other cool examples of this technology approach. CircuitLabs has a cool web based schematic capture and simulation tool that allows circuits to be shared with friends on the web. I could see that it would be a great way to teach electronics. The International Journal of RF and Microwave Computer-Aided Engineering has posted a special issue on EM-CAD models. The articles are free at this time. The Swedish Institute of Production Engineering Research is sponsoring the The Nordic Electronics Packaging Guideline web site. The site has a handy introduction to wire bonding that I found useful. There are guidelines on flip-chip, polymer bonding, chip scale packaging, ball grid arrays, and multi-chip modules. The MIT Media Lab has posted the Hi-low Tech web site that shows how to integrate high and low tech materials into projects. The site has a variety of projects including quite a few using textiles and fabrics with electronics. Igor Vytyaz has written a SPICE circuit simulator for Android called EveryCircuit. There is a video review of this app on YouTube, and it looks really cool and easy to use. EveryCircuit is available on the Android Market for $10. I was looking for some info on test equipment and found myself at Engineering TV. This is an interesting idea. The videos seem to be of a reporter talking to a company product rep on the floor of a conference expo. The reporter interviews the person demonstrating a piece of equipment or new product. The information content varies a bit on how good and knowledgeable the report is at asking good questions. Microwaves and RF magazine has produced their 50th anniversary issue. There are many articles that describe how microwave & RF technology has changed overt the years. One article that caught my interest describes the history of companies in the industry past and present: Where Are They Now?. I was surprise to see how many companies have come, gone, and merged. The US defense department spends $10B/year managing and mitigating obsolescence issues as reported in 2008 so this activity is a really issue for military projects and a potential opportunity for enterprising businesses, perhaps. Danial Payne has posted A Review of an Analog Layout Tool called HiPer DevGen at SemiWiki.com. This tool provides layout for differential pairs, current mirrors, and resistor dividers. It will account for Linear process gradients, Mask misalignment, Implant shadowing, Shallow Trench Isolation (STI), Length of Diffusion (LOD), Lithography invariance, Current flow direction, Antenna effect, Vt shift, snf Well Proximity Effect (WPE). Danial briefly describes competing layout tools and indicates that HiPer DevGen is more cost effective that similar tools on the market. There is a link to a video demo of the tool, but this require registration to view it. The Maker web site has posted an wonderful short video on how to read a schematics. The video is well done, informative, and has very good production values. Sweet. I feel they should have described the symbol for the transistor, but this is covered in the short article associated with the video. The folks over at SemiWiki have posted a wiki on the SPICE & FastSPICE circuit simulators on the market today. The Computer History Museum has set the web site An Analog Life: Remembering Jim Williams, and has an exhibit with Jim's workbench on display from Oct 15, 2011 through Apr 15, 2011. There is also a video of the panel discussion held at the museum that occur at the opening of the exhibit. Linear technologies turns 30 this year after a group of engineers left National Semiconductor to start a high performance analog semiconductor company in 1981. EE Times has an interview with Bob Dobkin the CTO and founder of the company. I'm impressed that some of their original designs are still in demand and being sold. I like his insight that if you build the highest performance device and you don't have to do it again. Sylvia's Mini Maker Show has posted a short video on a Super Simple Copper Etchingmethod. It's great and easy since you don't need a photo step to put you pattern on to the copper. You just rub it on from a image created on a plastic slide printed with the patten from a LaserJet printer. Ferric Cloride is used to etch the copper. She right in that it makes a big mess. Don't use it in the bathroom sink. Mom's get very mad. The stains don't come out. 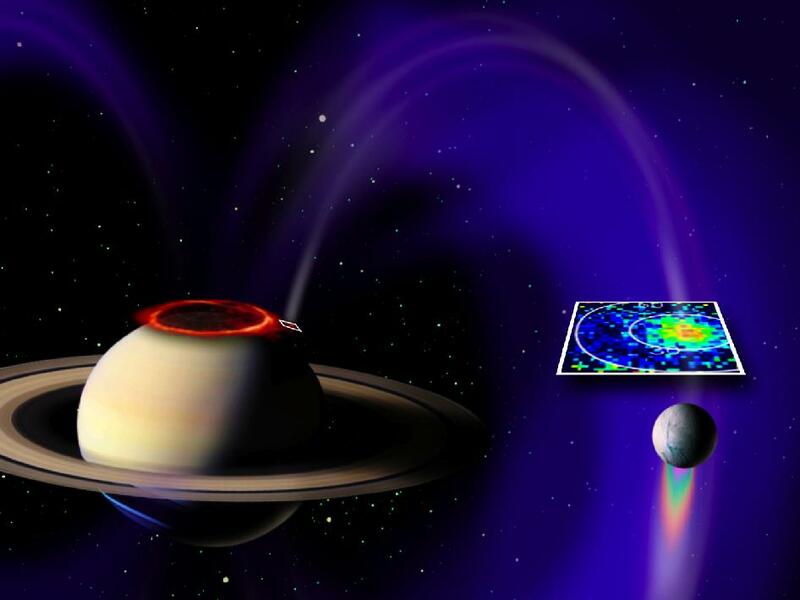 Did not know that a planet and moon could be part of an electric circuit, but Saturn and Enceladus are part of a giant circuit. I wonder what could be built from such things and if there are any SPICE models available . Annmarie Thomas professor at the University of St. Thomas gives this wonderful TED talk on squishy circuits. She describes how to use conductive and insulating play dough to make circuits. It's great a great way to teach very young childern how to make circuits. Her website provide the recipes on how to make squishy circuits.